In Japan, Sega tried to compete with Nintendo's dominant console, the Famicom. Among the benefits its 8-bit console, the Mark III, could boast were the ability to display more colors on the screen, a somewhat richer color palette, more built-in CPU and video RAM and a faster CPU. On the minus side, the Mark III had no pause or select buttons on its controllers, a lower screen resolution and inferior audio. The Famicom's 2A03 contained five audio channels (2x pulse, triangle, noise, PCM) to the Mark III's (integrated) TI SN-76489's four audio channels (3x square, noise). Moreover, the Famicom's audio channels were substantially more versatile in hardware than the Mark IIIs. Sega eventually released an FM Unit for the Mark III to help combat the Mark III's audio inferiority. The FM Unit contained a YM-2143 2-op FM synthesis sound chip. After it was released, most Japanese games would support both the Mark III internal audio and the FM Unit's audio. Forty-one Japanese games supported the FM Unit. Only eighty-six games were released in Japan for the Mark III. When the system was re-released in Japan as the Sega Master System, the YM-2143 chip was built into the console. Nintendo allowed for cartridges to contain extra sound chips. which could mix their audio with the internal Famicom audio. The first product that did this was the Famicom Disk System, whose RAM adapter included an extra sound channel. Seventy-five games for the Famicom Disk System are known to support the expansion audio channel, and about 190 games were released for the add-on. Unfortunately, neither company thought it fit to allow expansion audio in the consoles released in the West. The Nintendo Famicom sent its internal audio to the cartridge port. Games without expansion audio would simply send this right back to the console, which then went to the output circuitry. Games with expansion audio would take the audio from the Famicom, mix it with its own audio, and send the mixed signal to the Famicom's output circuitry. When the Famicom was released as the NES worldwide, Nintendo re-routed the audio so that it did not go to the cartridge port. Instead, a game could send its audio down one of the expansion pins in the middle of the NES connector, which would appear on a pin of the expansion port. Then this pin could be bridged with a resistor on an adapter that connects to the port to a pin that provided access to the NES's internal audio, allowing for mixing. The trouble was that Nintendo never released an adapter that bridged the necessary pins on the expansion port, so the functionality went unused. Additionally, Nintendo, which manufactured virtually all the boards for the NES, never released a board with expansion audio functionality except the MMC5 boards. No other company, licensed or unlicensed, ever did during the NES's lifespan. None of the games released for the NES using an MMC5 board use its expansion audio. Using Famicom games on a NES requires the use of a pin converter. Not all connect Famicom pin 46 (audio out) to any of the NES expansion pins. Krikzz's pin converter connects Famicom pin 46 to NES pin 54, which is what the PowerPak and Everdrive N8 NES version use. When Sega released the Mark III overseas as the Master System, it did not include the expansion port that would allow a user to connect an FM Unit directly. In addition, the pin connector for overseas Master System cartridges is 50-pins and the Japanese (and South Korean) cartridges use 44-pins. Sega did include a card edge version of the cartridge port on the back of the original Master Systems as an expansion port, but never released a peripheral that could connect to it. However, Sega unintentionally was kind enough to make it relatively easy to add FM sound to an overseas Master System. One resourceful hacker was able to recreate the FM unit as a board that plugs into the SMS's expansion slot : http://etim.net.au/smsfm/smsfm.html Removal of a capacitor and soldering three wires completes the job. Of these games, Battle Out Run, Double Hawk, Dynamite Dux, Summer Games and Rambo III require patches to get the FM Sound working. The available patches are for the Pro Action Replay, which is a device that patches RAM locations, not ROM locations. The Pro Action Replay may be difficult to come by. In addition, Wonder Boy III: The Dragon's Trap only gives FM music if it detects a Japanese Mark III or Master System but can be patched to always output FM music. A real Time Soldiers cartridge will crash if FM sound is detected, a patched ROM will fix this issue. The rest of the non-Japanese exclusive cartridges on that list should work in an FM-modded overseas Master System. Approximately 114 games were released for the Sega Master System in the US, and of those 46 or so games supported FM sound, most (all but five) without any modifications. That is nearly 50% of the games released for the system. Europe received about 270 SMS games, and got nine more FM supporting games, but more require patches. Still, compared to the NES, which did not receive many games that originally had expansion sound (eight cartridge games plus about eight to ten disk games), it is one thing SMS fans can boast about. When the Game Boy was released in the U.S. in August of 1989, it had three big advantages. First, it came bundled with Tetris, the Killer App. Second, with the console at $99.99 and cartridges at $19.99 the price was right. Third, the battery life of 20-35 hours was very impressive, especially compared to the competition (Sega Game Gear, Atari Lynx and NEC Turbo Express), which could barely muster 6 hours. The only disadvantage to the Game Boy was its four-shade monochrome screen, but compared to its predecessors, the Microvision, Game & Watch and Tiger Electronics toys, it was a huge leap forward. That drawback was not enough to keep people from buying millions of Nintendo's handheld system and few of the competition's handheld systems. However, GB games could take advantage of some of the SNES's features, such as the SNES's sound chip, input from the 2nd controller port, custom borders and an ability to provide more color to the game than the built-in palettes could provide. While the GB itself had three palettes of four shades available to the background and sprites, the SGB could not colorize these directly. Instead, it could apply a 4 color palette to every 8x8 pixel area. 4 color palettes were available with one common color. Thus at any time, up to ten separate colors could appear inside the Super Game Boy gameplay window. Beginning with Donkey Kong, games used the Super Game Boy to apply more colors than the built-in palettes. However, the most colorful screens were typically static screens. The application of color to a tile was based solely on the tile's position on the screen. In order to avoid tiles changing color depending on their location on the screen, games with SGB support typically applied a four color palette to the active playfield area. One exception to this limited color applied to the "window", a hardware feature of the Game Boy's PPU which allowed for stable status bars. Because the tiles within the window were stable regardless of sprite activity or screen scrolling, window tiles were typically more colorful than the active playfield area. Most games released after Donkey Kong would provide some level of Super Game Boy support, but eventually the support was limited to palettes and borders. These borders and custom colors would not be seen on a Game Boy Color, Advance or Player. There are games that saw a re-release for the Super Game Boy with support for SGB features. Centipede, originally released separately, was later released in a multicart with Millipede, is one such game. Super Breakout was similarly updated when released in a multicart with Battlezone. Asteroids and Missle Command were released separately as pure GB carts, then in a multicart with SGB support. Tetris 2 was released first as a GB game, but quickly updated with an SGB compatible version. The Game Boy Color supported a color screen and had a 15-bit palette of colors available. Each background 8x8 tile can select from 8 palettes with 4 colors each, and each 8x8 sprite can select from 8 palettes with 3 colors each. Thus up to 56 colors can be shown on the screen at any one time. However, this functionality is strictly limited to GBC games. When the Game Boy Color was released, Nintendo allowed for some ability to colorize GB games. When a GB booted up, the GBC would apply either the default palette entry or a palette entry customized for a particular game or set of games. The boot ROM of the GBC would compare the hash of the ROM with a table and if there was a match, it would apply a custom palette. While there were over 1,500 GB games, including variations, the boot ROM table only had entries for 84 of games. Nintendo's own titles always got an entry, but some third party games also received some entries. Weirdly, there are several games that will use a custom palette only for their European version. For example, Mega Man 1,2 & 3 will show a custom palette with Mega Man in blue, but only if the European cartridges are inside the Game Boy Color, Advance or Player. If there was no match, then the GBC could be told to apply one of twelve palette entries by pressing the A or B button, with or without a directional on the Game Boy Color's boot screen. The player would have to be quick to do this, otherwise the game would load with the default palette. In order to provide software for its new system, Nintendo released several of its games with new colorization using the GBC hardware. Often these titles had the DX suffix after their names. Thus there were The Legend of Zelda: Link's Awakening DX, R-Type DX, Tetris DX. These games provided substantial enhancements over their older versions. Other re-released games include Wario Land II, Centipede, Frogger, Legend of the River King GB, Harvest Moon GB, Prince of Persia, Space Invaders, Daffy Duck - Fowl Play, Looney Tunes, Ms. Pac-Man, Pac-Man, The Rugrats Movie, Super Breakout!, Titus the Fox. Pokemon Yellow, while it is a Game Boy Color game, hardware-wise, does little in terms of color beyond its SGB features. Japan received a colorized version of Balloon Fight (Balloon Kid overseas) for the Nintendo Power rewritable Game Boy Pak. The game was never released as a standalone cartridge. Konami colorized most of its Game Boy games and released them in Europe in four Konami GB Collections. Volume 1 contained Castlevania: The Adventure, Gradius, Konami Racing (F-1 Spirit) and Probotector (Contra : The Alien Wars). Volume 2 included Block Game (Quarth), Frogger, Parodius and Track and Field. In Volume 3 you could play Bikers (Motocross Maniacs), Guttang Gottung (no idea what this is, it might be unique), Mystical Ninja (Ganbare Goemon), Pop'n Twinbee. Perhaps the best collection was Volume 4, consisting of Antarctic Adventure, Castlevania II: Belmont's Revenge, Gradius II: Return of the Hero & Yie Ar Kung-Fu. Castlevania II on this cart is interesting because the U.S./European GB version had the holy water as a weapon, but the colorized version found on this cartridge had the Cross, which was in the Japanese GB version. Interestingly, Capcom had intended to colorize its Game Boy Mega Man games and was going to release them as a Game Boy Advance cart (Mega Man Mania or Mega Man Anniversary Collection), but the cart never materialized. Finally, there are hybrid games that first saw a release with GBC support in mind. By allowing cartridges to be backwards compatible with the Game Boy while being able use the full color features of the GBC, Nintendo allowed its monochrome, 1989-vintage machine a few more years of life. The hybrid games are really GBC games with a black & white option. Thus the contrast may not be ideal where the color version uses dark backgrounds, as in Mega Man Xtreme. There may be odd color choices, like the white beard for Arthur in Ghosts 'N Goblins that makes him look like Santa Claus. The game may not run as smoothly because the GB runs at 4MHz and the GBC runs at 8MHz. Blaster Master: Enemy Below is one game that is sluggish on the GB where it is fairly smooth on the GBC (the NES game is smoothest of all). Graphical tricks may not be present in the GB because the GBC has a much better ability to perform "raster" tricks in hardware. Dragon Warrior Monsters 2 was the last hybrid game released, on September 15, 2001, thus giving the Game Boy (from July 31, 1989) twelve years and forty-five days of continuous support. That is second only to the Playstation 2 and (perhaps) the Atari 2600. The Game Boy Advance acts exactly like a Game Boy Color. The Game Boy Player for the GameCube acts like a Game Boy Advance, even though it is similar to a Super Game Boy. It does not support any Super Game Boy functions, but it does allow you to play Game Boy Color games on a TV. The earliest Atari 2600 cartridge that could load games was the Cuttle Cart. This used the Starpath Super Charger method to load games by converting the binary file into an audio signal which the Cuttle Cart would receive and load into its 64KB of RAM. It was very impressive for its time because it could run virtually the entire 2600 library. However, it was slow, every file had to be converted, only one game could be stored in its RAM at a time and the audio connection was not always reliable. (There was a utility to convert binary files on the fly, and when I onwed one I rarely had an issue when a game was corrupted.) Next came the Krokodile Cart, which supported serial transfers and a menu but was not as compatible with as many games. It did come with 512KB of Flash to load games and 32KB of RAM for games that required it. This Christmas I was extremely fortunate to acquire an Atari 2600 Harmony Cartridge. The Harmony Cartridge is a flash cart that can load games off SD cards (SD Version) or microSD cards (microSD Version). 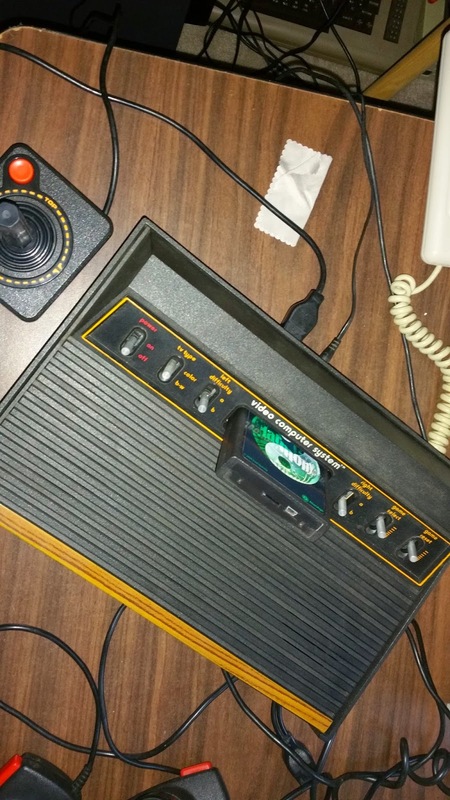 It will work with just about any Atari 2600 game ROM in existence. The Harmony supports SD and microSD cards up to 32GB in size, and has 32KB of Flash and 8KB of RAM for games. When the Harmony boots, you will see a Ying/Yang symbol for a second, then go to a menu. The Harmony supports folders and can display ten files or folders on a page and twenty four characters of a file or folder name. It has a page number to help keep your place in directories. It will not automatically sort files and folders alphabetically, use a Windows program like Drive Sort for that. You may wish to truncate file names for a more refined cosmetic experience and make a note if they require a controller other than a joystick. I place the games that require Paddles in separate directories. When you select a game, you will see the Ying/Yang logo for a second or three as the game is burnt to the Flash, but it is very quick. Then the game will start as if you had the original cartridge in the slot. And this cartridge will play anything ever released during the 2600's lifespan (with one exception, see below) and most homebrews and reproductions (provided you can find a good dump of the ROM). The price of $60 is so reasonable I wonder how any money is being made off these carts, and unlike some other flash carts, they are readily available for purchase. Even collectors can take advantage of the Harmony. If you collect games with boxes, you can keep the original cartridge in its box and use the Harmony to play a game. A 32MB SD or microSD card can easily fit every ROM ever made for the 2600, but you can use far larger cards. If you buy a 2600 at a garage sale or on Craigslist just to play games, save the money you would have had to spend on cartridges and just buy this instead. The Harmony Cart can be navigated with a joystick, paddle or driving controller. This is slightly annoying for the few games that principally use the Keyboard or Kid's Controllers because you will have to plug in a joystick to select the game and then replace it with the Keyboard or Kid's Controller. It also works with Sega Genesis gamepads, but you should hold the B button when you turn the power on so it is properly detected. BIOS updates used to be accomplished with a miniUSB cable and software available for Windows, Mac and Linux. The software will load an updated BIOS, downloaded from AtariAge, to the cart. The BIOS, v1.5, was last officially updated in 2010. However, as of v1.5, the USB method is no longer required, you can update the BIOS just by selecting it in the menu. There is a v1.6 beta BIOS available. One important original game that the Harmony cart supports it Pitfall 2, which used a complex bankswitching chip that allowed for more complex sound and was not emulated in the earlier flash carts. 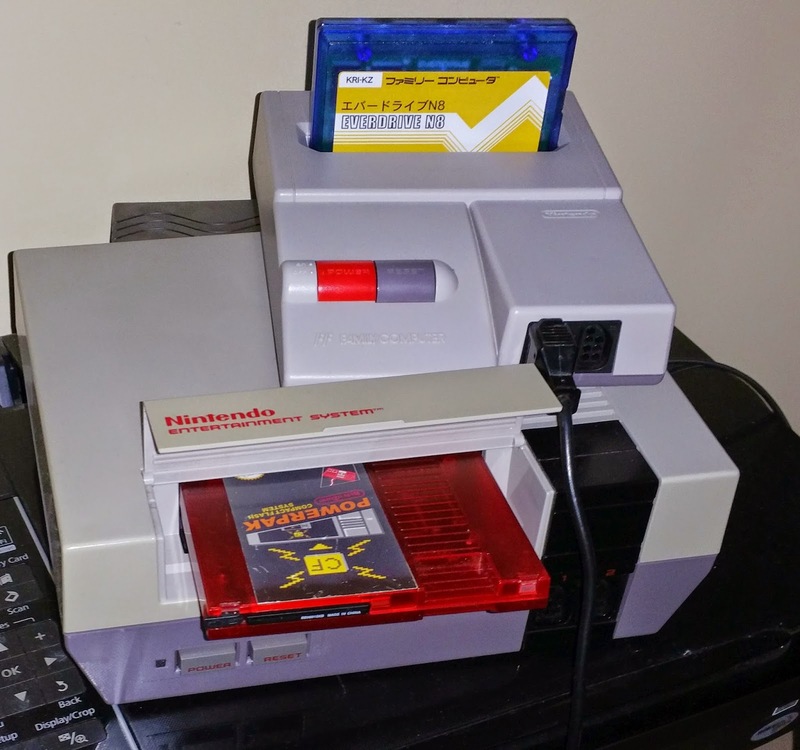 For this and the sheer number of bankswitching schemes supported, and the ease of putting games on the cart and the number of games you can have on the cartridge, the Harmony cart has essentially made the older carts almost completely obsolete. The Harmony's firmware can be reprogrammed to support new bankswitching schemes. In 2014, the maker of Harmony Cartridge, batari, released an updated model of the cartridge known as the Harmony Encore. The Encore can support games with a chip that can be configured as 512KB of ROM, RAM or any power of two combination. It costs $25 more, but the number of additional games it can play is severely limited at the moment. It adds support for the F0 Megaboy 64KB cartridge, the only cartridge released during the 2600's lifespan that reached 64KB in size. However, the Encore makes the serial-port based Krokodile cartridge totally obsolete. 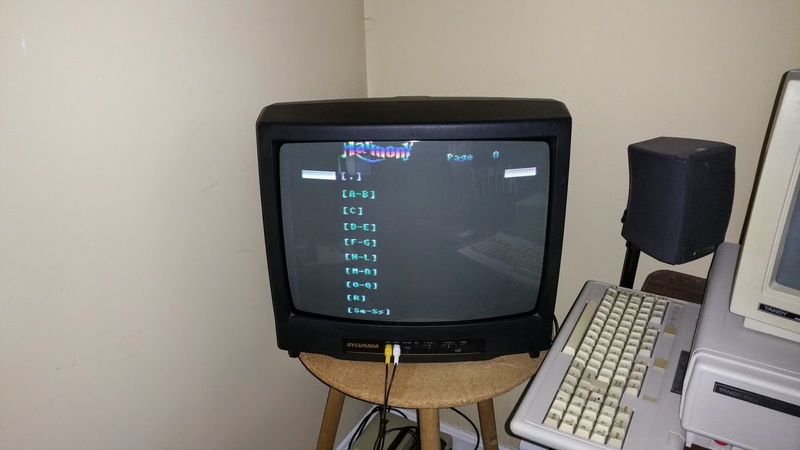 The Harmony Encore can play several advanced homebrew games and demos, such as Boulderdash (3E, demos only, full game ROM not released) and Stella's Stocking (X07, ROM not released) and Zippy the Porcupine (demo only, full game ROM not released) homebrews. It also supports new bankswitching schemes, EF (64KB), DF (128KB) and BF (256KB), all with or without a 128B SARA chip. However, in my opinion there is precious little software for it to be worth the extra $$. In a year or two, my opinion may change. Moreover, you can upgrade your Harmony to a Harmony Encore for $25 by sending it back. In conclusion, should you buy a Harmony Cartridge? If you want to play 2600 games on real hardware and don't want to go through the hassle of tracking them down, then absolutely. Early in 2013, Krikzz released his Everdrive N8, the latest in the famed Everdrive series. Unlike most of his Flash Carts, the Everdrive already had serious competition from the NES PowerPak, released in 2007. The Everdrive N8 has several advantages over the PowerPak. First, it uses SD (NES version) or microSD (Famicom version) cards. SD cards are cheaper and easier to find then the Compact Flash carts that the PowerPak supports. They do not connect to a pin connector, so it is much less likely you will damage the connector. SD cards are supported up to 32GB and it supports FAT16 or FAT32. Second, it comes in a Famicom variety, which is awesome for those of us with a Famicom AV. Krikzz even sells translucent Famicom cartridge shells. You can see the LED showing the cartridge's operation. The Famicom version supports mixing external audio emulated in the cartridge with the Famicom's internal audio. Krikzz sells a 60-72 pin adapter that will allow you to use the Famicom version inside a NES. You will only need to slightly modify a standard NES cartridge shell to make the two boards fit. You can get the best of both worlds here. If you wire Famicom connector pin 46 to NES front loader pin 51 or NES top loader pin 54 and solder the appropriate resistor to your system, you should be able to obtain expansion audio from your NES. You can use the PowerPak on a Famicom or Famicom AV, but all the 72-60 pin converters I have tried are very poor. The best one is too thick for the cartridge connector, and the rest use the cheapest plastic covers, have no supporting cover, and do not connect all the necessary pins or their edge pins are too short. Krikzz's 60-72 pin converter is excellent and fits inside a NES cartridge shell very well. Third, the Everdrive N8 has an advantage in picture quality over the PowerPak. With the PowerPak, there are faint jailbars present whereas on an Everdrive they are much less noticeable. I can see faint jailbars (sitting three feet away from a 19" CRT TV) in the blue background of Super Mario Bros. (real cart) on a front loader, but I can barely notice them on the Famicom AV with the Everdrive loading Super Mario Bros. With the PowerPak the jail bars are quite noticeable, although it is not as bad as a NES Top Loader. Fourth, the Everdrive supports automatically backing up saves to its RAM. It has a replaceable coin battery to allow this function to work. The PowerPak requires a reset to the menu. If you do not reset, you lose the save. Also, the PowerPak used to (and may still) require that the user create a blank save file, the Everdrive creates a new file automatically. One exception is FDS games, both flash carts require pressing reset to save data onto the .fds disk images. Both the PowerPak and Everdrive N8 support the entry of five Game Genie codes, but the Game Genie functionality does not work with every PowerPak mapper set. The Everdrive supports Save States officially, whereas the PowerPak's save state support only comes with 3rd party mappers. In order to play the two MMC6 games, Startropics and Startropics 2: Zoda's Revenge, the save state feature must be turned off in the options menu. The Everdrive N8 supports file sorting without using a program, the PowerPak requires a program like DriveSort to accomplish the same thing. BIOS updates for the NES PowerPak require the cartridge to be shipped back to retroUSB. BIOS updates for the Everdrive can be performed with an SDHC card. Only Everdrives shipped in the first two weeks would need a BIOS update. The NES PowerPak costs $135.00 from retroUSB, the Everdrive N8 costs $119.00 from retrogate (including a is with a shell), so it is a bit cheaper. Because there is only one source, you don't have to play the game of find a mapper file that will make your game work with an Everdrive. Things are much easier as a result, and rarely has there been a mapper regression, which cannot be said about the PowerPak mappers. In the seventeen months between the earliest and the latest OS versions, the Everdrive has come a long, long way. I could not get every important MMC3 games that used the scanline counter to generate an IRQ (split screen effects) to work properly in the PowerPak, regardless of mapper I tried except by using thefox's original save state mapper. I have no such complaints for the Everdrive. The Everdrive does not have the issue of corrupt background tiles in certain games like Noah's Ark, which may be an insolvable problem with the PowerPak. I could never get FDS Metroid to work in the PowerPak, but it plays fine in an Everdrive. Neither flash cart supports the VRC7 mapper or its sound. The PowerPak mappers have more accurate expansion audio. The PowerPak FDS support will also let you delay the automatic disk swapping to allow the introductions of Zelda no Densetsu and Doki Doki Panic to work. However, the Everdrive can set its emulated audio output mixing to low or high, which may be useful for late Famicoms and all Famicom AVs, which supposedly have quieter internal audio output. The PowerPak is compatible with a CopyNES add-on, in fact it can use CopyNES to update its bootrom. retroUSB sells both. The Everdrive N8 refuses to work in a CopyNES-modded system. On the other hand, the Everdrive is more friendly to clone systems than the PowerPak. The PowerPak can play NSF audio files, the EverDrive requires them to be compiled into a ROM, and that is not easy to do. The PowerPak supports Death Race and will play the Nintendo World Championships cart, but the timer can only be changed by using an alternate MAP069.MAP file. All the above work on the PowerPak without glitches except for Mickey's Safari in Letterland, Uncharted Waters and Bandit Kings. Using Game Genie codes requires a bit of explanation. First, you must select the ROM you want to play. Do not use the Select + Load option. Then go into the cheats menu by pressing select. In the cheats menu, you hold down B and use the D-pad to select a letter. If you have swapped A/B in the options menu, you must use A instead. The on-screen instructions do not change to reflect this change. When you have entered all the codes, you exit out of the cheat screen using select and then A or B. When you get back to using a cursor to select a ROM, press start to load the game and the cheat code will be applied to it. Most people today use the No-Intro set for the basic set of properly dumped ROMs. However, even with this set there are games that will not work. Some do not work properly in emulators or flash carts because they lack headers. If the game's size is an even number like 24KB, 32KB, 40KB, 48KB, 64KB, 80KB, 96KB, 128KB, 160KB, 192KB, 256KB, 320KB, 384KB, 512KB, 640KB, 768KB or 1,024KB, then it will appear as a bad ROM. Every NES ROM file should be 16 bytes larger than the pure dump, thus appearing as 25KB, 33KB, etc. Adding a NES header is easy enough. Other games do not work properly, or at all, because they have the wrong information in their headers. The header format flash carts support is the iNES 1.0 format, established back in the late 1990s when so much was yet to be learned about NES and Famicom cartridge hardware. A header tells the emulator or flash cart how much PRG-ROM, CHR-ROM (if any), and PRG-RAM (if any) the cartridge has. It will also tell the emulator whether the PRG-RAM is battery backed and the mirroring scheme the cartridge uses if hardwired or special (horizontal, vertical or four-screen). It also has some useless and unsupported bits to inform an emulator whether the game is an NTSC or PAL game, if it is a Vs. System or Playchoice-10 game and whether it contains a pirate trainer. Today, all Camerica/Codemasters games, with four exceptions, use Mapper 71. They used to use Mapper 2 and the extra bits of Mapper 71 are really not important for emulation or a flash cart (with one exception). These problems will go away if you change the mapper to Mapper 2. Fire Hawk is the sole exception, it must be Mapper 71 and appears to play fine. The Quattro games (Action, Adventure, Sports) use Mapper 232. Cybernoid - Use or permanently patch the ROM with Game Genie code SXZNZV to get the game to work properly after you change the sound mode from sound effects to music. These games work OK on the PowerPak without patches. With the current OS, the two US four-screen mirroring games must use Mapper 04. This is always the case for Rad Racer 2, but Gauntlet ideally uses the less advanced Mapper 206. Change it to 04, which will harm nothing as far as Gauntlet goes. If the value for the mapper is FF, then it is unsupported. If you want to add a mapper, you must convert the decimal number into hex, then enter the hex value in the appropriate byte in the MAPROUT.BIN. No PowerPak mapper supports the VRC7 games at all. If you have a HiDef NES mod, you can use it to emulate the VRC7 audio for Lagrange Point. You will have to revert to OS v3 for the EverDrive to work with a HiDef NES mod. No Famicom MMC5 game can be expected to work correctly. Any game using the Bandai mappers 153, 157 and 159 will probably not work. Study Box will never work properly on any Flash Cart because it embeds a cassette deck. Galaxian - Must be an overdumped 24KB ROM, real cartridge is only a 16KB ROM, which is outside the iNES specification. GoodNES's [!] rom will work. Also has a Rev. A. Same fix required for PowerPak. The Everdrive N8 is an excellent product that has been well-implemented and boasts a very impressive array of mapper support. With the proper ROMs, it will make your NES or your Famicom work with well over 1,000 games. It has given the NES PowerPak serious competition and may yet completely eclipse it. The Everdrive GB Review - Game Boy and Game Boy Color Fans Rejoice : Your Prayers Have Been Answered! Last year, Krizz released his long-anticipated Everdrive GB. The Everdrive GB is a flash cart that supports Game Boy and Game Boy Color ROMs. It is extremely important for two reasons. First, it is a modern cart that uses removable micro SD cards to hold ROMs. Earlier cartridges relied on flash memory built into the cartridge itself, which limited the number of games that could be stored on the cartridge at any one time. The use of an SD card means that you can use any device that will write to an SD card to load games onto it. The EMS Smart Cart 64M(egabit), probably the most widely available older-style Game Boy/Color flash cart, only supports two 4 Megabytes banks for games. It also requires the use of software to load games. This software uses an unsigned driver and intended to work with Windows XP. Getting it to work on Windows Vista, 7 or 8 is an increasingly annoying hassle. The Everdrive GB supports up to a 32GB microSD card, formatted with FAT32. A 2GB or better card can easily hold every ROM you would ever want to play. Second, unlike the other flash carts currently on the market, including the EMS Smart Cart, it is designed to play games, not for music creation. The Everdrive does not need any configuration files or mapper files. Out of the box it supports the MBC1, MBC2, MBC3 and MBC5, which encompasses virtually every licensed Game Boy and Game Boy Color game. It also of course supports no-MBC cartridge ROMs like Tetris (32KB). The EMS Smart Cart only supports MBC5, which virtually all Game Boy Color games use but no pure Game Boy game needed to use. Unfortunately due to differences between the MBCs, this caused many issues with Game Boy MBC1, MBC2 & MBC3 games. Also, there are Game Boy and Game Boy Color games that, intentionally or inadvertently, do unusual things with the Game Boy hardware that screws them up when playing on an old-style flash cart like the Bung GBXchanger or the EMS Smart Cart. The Everdrive GB does not have these problems. The Everdrive also supports Super Game Boy features and also allows the Game Boy Color and Game Boy Advance to display custom color palettes for recognized monochrome Game Boy games. You can still change the palette used for Game Boy games in a Game Boy Color or Advance using the d-pad and buttons. This is why it starts twice (except for Super Game Boy, see below), once for the menu and then a second time for the game. This ensures maximum compatibility. As of this writing, there are no OS updates, all you need is a formatted microSD card and you are all set. Compatibility is the key here. When I purchased the EMS Smart Cart, there was always a possibility that Game Boy games would fail to work for some reason or another. This would require the game to be patched. I contributed a few patches myself, but even so, issues still crop up from time to time. With the Everdrive GB, you won't have to worry about your game suddenly crashing or failing to save. I have tested many of the games that required patches with the EMS Smart Cart and all worked without any problems on the Everdrive GB. It supports entering sixteen Game Genie codes, but this feature is somewhat hit or miss. You can change the type of MBC emulated if you wish, but no game needs this feature. Whereas the EMS Smart Cart would load all games onto its internal memory and allow instant access to whatever games it could hold, the Everdrive GB must write a game stored onto the microSD card into its internal flash memory. There is 8MB of flash memory, most commercial Game Boy Color games maxed out at 4MB, and there is only one licensed game, from Japan, that uses 8MB. The Flash is written to in 64KB blocks, and each period you see after Write, which corresponds to an LED pulse on the cart, means it has written a 64KB block. A 4MB game, the largest typical commercial Game Boy Color game, would take sixty-four periods. Each block can be written to in less than a second, which gives less than a minute for the largest Game Boy Color game to load. Note that Game Boy Color, Advance and Player systems have a CPU that is twice as fast as the CPU in the Game Boy, Pocket, Super or Light, so they will write ROMs much faster. While this is slightly less convenient than the EMS Smart Card's instant access, you can restart the game that was last written into the Everdrive GB by pressing start when you next turn on the system. This save you from having to wait while the game is rewritten. There is a coin-style battery used to store the contents of the battery backed S-RAM when the system is turned off. The cartridge will write the contents of RAM to a file automatically when you start another game. Everdrives run off a menu system that displays a page of a folder at a time. Each page on the Game boy can show twelve files or folders at a time. The first twenty characters of the file or folder's name will appear in the selection area. There is also a three row shaded area on the bottom of the screen that will show the first sixty characters of the currently highlighted folder or file. This should be sufficient to identify most games without having to eliminate too much of their file name. It is a very convenient system to use. Despite the currently-available cartridges using a Game Boy Color-shaped translucent cartridge shell, it will fit and work inside an original DMG Game Boy (original off-white and "Play it Loud" colors). There is a plastic corner cut into the back that allows the power switch tab the appropriate amount of room to allow the switch to move into the ON position without any problems. Patches exist for the Pokemon games to allow you to set the clock before running the game or loading a game, but the clock will not change while the game is playing. Games should work otherwise. The RTC functionality in Harvest Moon is pretty limited, so you won't miss it. Games still work and some came with and without the rumble feature. The rumble feature is only slightly missed. ROM may work, but functionality will be severely restricted. Only used with one Game Boy Color game, Kirby's Tilt 'N Tumble. You aren't missing much with the lack of support for these unlicensed games. Graphics will be too garbled to play, just like most emulators. The great bgb emulator does support these games, if you feel compelled to try and read the bible on a 160x144 screen. These games will work in a real Game Boy but not in an Everdrive GB. These were unlicensed Game Boy Color games by Rocket Games, a label from Datel and InterAct, makers of the GameShark and Pro Action Replay cheat devices. They also issued some multi-carts with these games. I assume these games will work in a real Game Boy Color. They do not work in an Everdrive GB. Sachen and Gowin also released unlicensed Game Boy and Game Boy Color games, but they are too obscure and awful to be worth mentioning. They will not work in an Everdrive GB. Uses the MBC1 chip in an unusual way, trying to select a game will just go back to the menu. Play the standalone releases instead. Typical MBC1 games have a maximum 512KB ROM, if the ROM size is 1MB like Mortal Kombat (and there are a few Japanese games like Genjin Collection that are that large) it will not work in an EverDrive. The EMS Cart may work if only one game is on it, but the Everdrive GB will not. These music cartridge programs are not fully supported on the Everdrive GB. Nanoloop uses custom hardware and saving songs does not work in the Everdrive GB. LSDJ requires 128KB of RAM available to it. The Everdrive GB only makes 32KB of RAM available, which is all that virtually any Game Boy and Game Boy Color game would ever need. Only individual songs can be saved. The EMS Smart Cart is a better choice for LSDJ. All other official Nintendo Game Boy systems will work, including those that take batteries. 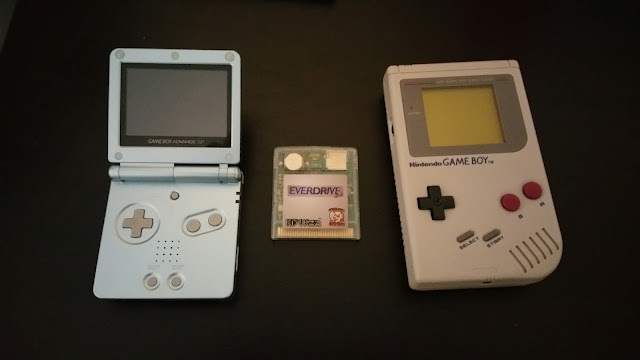 This includes the DMG Game Boy, the Game Boy Light, Game Boy Color, Super Game Boy, Game Boy Advance, Game Boy Advance SP (front lit and back lit) and the Game Boy Player. They have no problems with good rechargeable batteries like the Eneloop. Please do not be alarmed by the above list, it is really only a small fraction of the Game Boy and Game Boy Color experience. R-Type DX will not work properly until you perform a soft reset using Start + Select + B + A.
Shantae will write a save file which cannot be copied or deleted in a card reader. The game will save and load games just fine. This could be an issue with my micro SD card. The Everdrive GB certainly works on the Super Game Boy. It will support games with Super Game Boy features like Donkey Kong and Kirby's Dreamland 2. It will work just fine with Space Invaders, including the part that transfers control to the SNES to play The Arcade Game. However, 24 of Nintendo's games had a predefined palette, and when inserted in the Super Game Boy, the hardware would default to the specified palette. When you first load a game with the Everdrive GB, you will see the default palette. You can change it manually to the correct palette, using the information from here : http://tcrf.net/Super_Game_Boy_1_and_2, or you can push the reset switch of the SNES. When the Super Game Boy boots back up, you will see the predefined palette. One minor complaint I have is that the button to select a game or an option is B and the button to go back is A. This just feels wrong on a Nintendo system with two buttons. This can be changed on the Everdrive N8, but not here. I do not have a problem with this scheme on the Mega Everdrive because a Genesis controller uses three or six buttons. With GBOS v2, you can now swap A & B buttons so that A does the selecting and B goes back/cancels. Just put it in the GBOS.GB file in your EDGB directory on the SD card and that is it. It adds a half a second to the startup time because it has to load the file into RAM rather than have it embedded on the FPGA. The Everdrive GB saves games in 32KB files. Typically only the Pokemon games used battery backed save RAM that large. Most Game Boy and Game Boy Color games used 8KB and some used 512 nibbles to save. Editing save game files will require an extra step. The Everdrive GB will not sort files alphabetically, you will need a program like DriveSort for that. The Everdrive GB, while a bit more expensive than previous Game Boy flash carts, is a steal at $88.00. I cannot recommend it highly enough to all fans of 8-bit handheld Nintendo games. 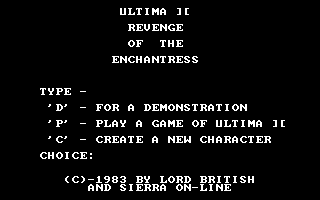 In 1982, Richard Garriott, Lord British, made Ultima II: Revenge of the Enchantress for the Apple II computer. 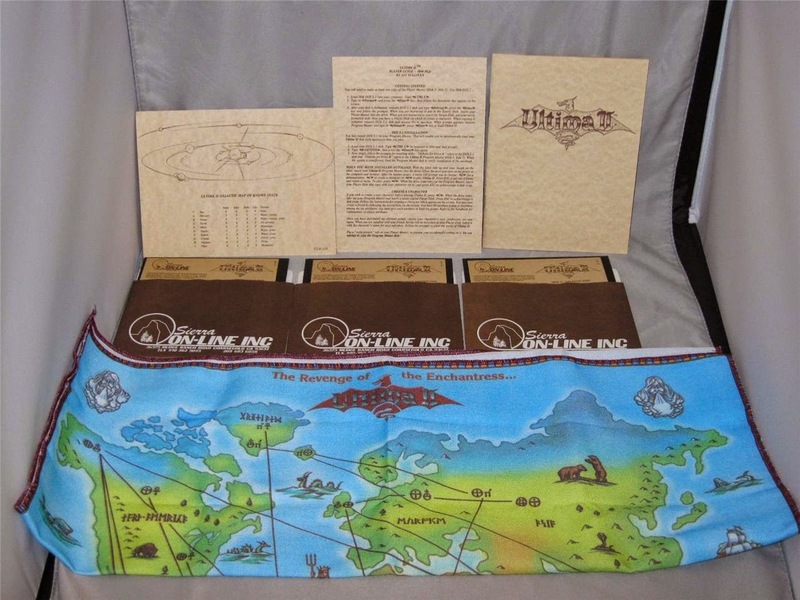 His previous games, Akalabeth and Ultima, had been released in ziplock bags, but not only did LB demand a box for his sequel, but also a cloth map. No publisher would agree to this,except for up-and-coming Sierra On-line. There began a short-lived relationship between two soon-to-be giants of the computer gaming industry. As part of its SierraVenture line, Sierra would also release a port of Ultima for the Atari 8-bit computers, and would eventually release the obscure Ultima : Escape from Mt. Drash for the Commodore VIC-20. However, Sierra and LB's main collaboration would be Ultima II, which would be released for the Apple II, Atari 8-bit, Commodore 64, Macintosh and Atari ST computers as well as the IBM PC. Sierra would commission ports and sold the game at least until 1986. LB decided to start his own publishing company with Ultima III: Exodus. It is the PC version of Ultima II which this entry will primarily focus upon. 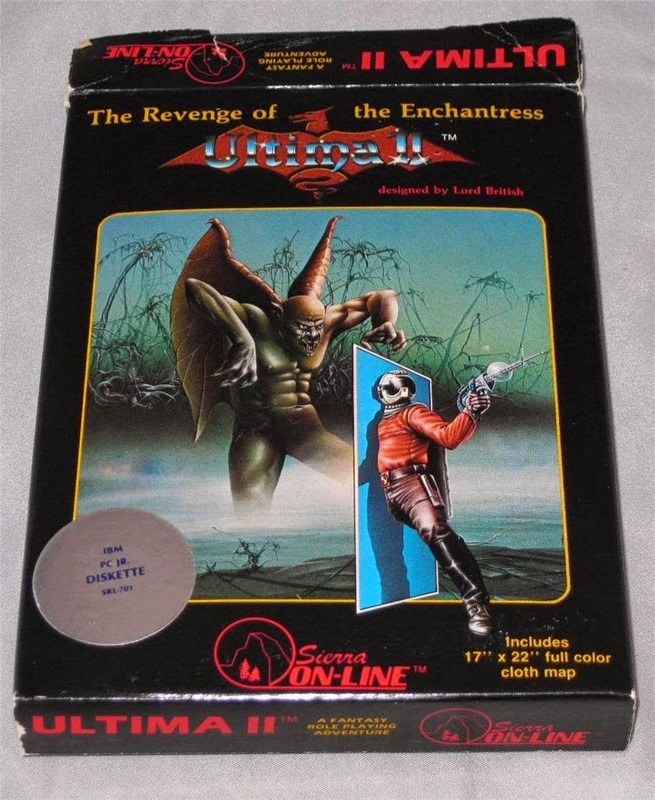 There are four major physical versions of Ultima II for the PC. The first is the original release for the IBM PC by Sierra. Next came the IBM PCjr release, also by Sierra. Later, Origin Systems reacquired the rights to Ultima II and included it in the Ultima Trilogy. Finally, Origin released it on CD collections with other Ultima games, culminating in the Ultima Collection. The system requirements were very modest indeed, only 64KB of RAM, a CGA card, one floppy drive and DOS 1.1 were required. Use of DOS 2.0 required 128KB of RAM. While an RGB monitor could be used to play the game, it was intended for color composite monitors and TVs. This is a game where an older CGA card may be more appropriate to use because the Viper in the dungeon demonstration screen is green with old CGA and blue with new CGA. However, the old CGA card requires quite the brightness and contrast boost on most TVs to make the blue color stand out. Ultima II came on three 160KB single sided floppy disks. Disk 1 is the Program Master Disk, Disk 2 is the Player Disk and Disk 3 is the Galactic Disk. This version's Program Master Disk is copy protected with a protection called "Copylock", which was used on several other Sierra Online releases during the 1983-1984 period. All disks are readable by real MS-DOS or PC-DOS. Windows may not be able to read these disks because they use the DOS 1.x format, which is slightly different from the standard 2.0 format. Sierra did not to use flippy disks because double sided drives were beginning to be introduced. In fact, you can install DOS 1.1 on the disk to make it bootable. DOS 2.0 takes up too much room, so it cannot be installed, at least for the releases of the game that came on a 160KB disk. Sierra used the Softguard protection on the DOS releases of its AGI engine games but with its own, easier to crack loader. The Player Master and Galactic Disks are still singled sided 160KB disks and unchanged from the 1983 disks. The Player Master disk was meant to be copied through a normal DOS DISKCOPY command. The original Player Master disk should never be used to play a game because it cannot be reset. If you see a copy of any version of Ultima II with the write tab perforated on or cut into the Player Master disk, be very wary of buying it if you intend to use the software. 2. Ultima II for the IBM PCjr. Sierra apparently could not get its Formaster Copylock copy protection working on the PCjr. (due to the lack of DMA most likely) so the Program Master Disk is actually not copy protected. Disk 1 is increased in size to 180KB to accommodate copying DOS 2.1 with the SYS command to make it bootable on the PCjr. Considering that this version was generally unknown until recently, it almost certainly did not sell many copies. The only known complete physical copy comes in the black bordered box and the full-size 22"x17" cloth map. When this is run on a PCjr., the system will need 128KB. You should boot this disk from the built-in DOS, if any, or make it bootable with PC-DOS 2.1 SYS command. Otherwise, if your system has a sidecar RAM expansion, do not load a memory manager when playing this game. The game will run too fast. The PC version can be run on the PCjr if cracked, but the colors will be less than ideal. However, if run with 128KB, it will run slower than it should. If run with 256KB or more and a memory manager installed, it should run at an appropriate speed. By 1989, Origin Systems had reacquired the rights to publish Ultima II, and they were preparing to release the first Ultima trilogy with Ultima I, II and III. This box came with four disks, with Ultima I (Enhanced Re-release) taking up one disk, Ultima III taking up a second disk, and Ultima II requiring two disks. All three games are copy protected, with Ultima I and II using Origin Systems, Inc.-1 (OSI-1) in-house copy protection. For all PC floppy versions of Ultima II, you cannot run them from a hard drive, despite being DOS disks. This is because the Player Master and Galactic Disks use several of the same file names, but the files themselves are different. This reflected the way the disks were distributed on the Apple II original, which used 143KB disks. When the game was ported to the IBM PC, they used single sided disks with 8 sectors for 160KB, allowing the game to be used with single-sided drives and DOS 1.1. For the Ultima Trilogy, Origin Systems used 360KB disks and put the Program Master and Galactic Disks onto a single disk. In 1989 everybody was using 360KB disks (requiring DOS 2.0 or better) and double sided drives, so this was unobjectionable. The were no files with the same names on the separate Program Master and Galactic Disks. The Player Master Disk was left on a separate disk. The game will not save when you are not on Earth and never writes to the Program Master* or Galactic Disks. * - The player may write to the Program Master disk to make it bootable, but for the Ultima Trilogy version, it comes as a bootable DOS 2.1 disk. MAPX## gives the tile definitions for each of the 64x64 tiles on each map and the definitions for each dungeon and tower level and the MONX## are the monster/NPC placement files. The TLKX## files are for the text for the NPCs in the towns, villages and castles only. PLAYER gives the stores the statistics for the player character. MONSTERS holds the graphics for the dungeon monsters. Fortunately, Moonstone Dragon's Patch fixed this in time for the Ultima Collection. The PC and Apple II versions of the game use the same Player Master and Galactic Disk files. None of the official Origin releases contain the patch. As you can see, there was nothing critical omitted from the game by the effective removal of Mercury, Venus, Mars and Jupiter. In the original Apple II version, there is a screen in the demonstration that says "PLEAD WITH MEDIEVAL KINGS FOR ASSISTANCE." Unfortunately, due to the inefficient way in which the demonstration screens were stored (16KB CGA full-screen bitmap instead of using a 200 byte tilemap) and the use of PC-DOS instead of a custom bootloader, there was no room on the Program Master Disk for this screen. This can be restored with Voyager Dragon's Ultima II Upgrade Patch. 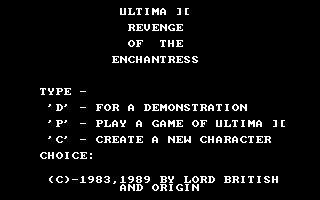 Additionally, the Apple II and Atari 8-bit versions have an animated title screen with the dragon breathing fire to reveal the ][ and the "REVENGE OF THE ENCHANTRESS" caption. In the PC versions, this is a static screen and the sound effects are not present. One improvement of the PC version vs. the Apple II and Atari 8-bit versions is that the Strength bug is apparently absent on all copies. In the early Apple II and Atari 8-bit versions of the game, the Clerk in New San Antonio will not raise your Strength attribute, but will raise other attributes. This is the only way to raise your Strength in the game, absent hacking or implementing a bug fix by writing to the affected sector on the disk. One other point of interest is the Pangea Greenland Dungeon. According to the README supplied with Moonstone Dragon's Patch, Origin apparently removed the entrance to the Pangea Greenland Dungeon because the map file for the dungeon itself was corrupted when they ported the game to the Ultima I-VI Series CD. However, the entrance is not on the IBM PC, IBM PCjr. or Ultima Trilogy versions. It seems that if the error was "fixed", it was fixed by Sierra back in 1983. Of course, no one apparently realized that the Greenland Dungeon is present in all four Earth timezones and is identical in each. All they had to do was to make a copy from one of the other files and rename it. (This is not the only time a port of Ultima II was missing a feature, the Atari 8-bit version is missing Pangea dungeon and the demonstration screens, probably because the disks at 90KB were too small to include the pictures). The Apple II versions, both the older :ON-LINE SYSTEMS PRESENTS" version and the re-released "Origin Systems Presents" version have a Pangea dungeon entrance and an uncorrupted dungeon. The Sierra On-line versions of Ultima II had no speed limiting of any kind. At the time, 1983-1984, there were only two system speeds in wide use, the PC and the PCjr. These games will not necessarily crash when played at faster speeds, but may be unplayable at AT speeds. When Origin released the Ultima Trilogy in 1989, it included speed adjustment code in this release for people with AT class systems. The program will count CPU cycles and try to adjust itself, but eventually will give a Divide By Zero error once the CPU speed increases past a certain threshold. This was carried over to the Ultima I-VI Series CD. The version in the Ultima Collection replaces the speed test with a hard coded delay value, but the value was way too small for the systems of 1998. However, the Collection included a version of MoSlo for all the Ultima games. Ultima II is very annoying because it can overwrite the files on the Player disk. If some cheap idiot used his original Player disk to save a game, then the game will not be able to restore it to its pristine state. Fortunately, they can be fixed. The only files the game saves to are MAPX10, MAPX20, MAPX30, MAPX40, PLAYER, MONX10, MONX20, MONX30 & MONX40. Replace those files with untouched versions and you enjoy a new game of Ultima II. The pristine PLAYER and MONX files only have 00s in them. Note that MAPX10, which is the Pangea map, will not have the dungeon entrance unless the file has been patched. Since I own an IBM PC and an IBM PCjr. and have access to all PC versions of Ultima II and some of the sounds rely on effects not properly emulated at present and speed-sensitive, I decided to record the playback from the respective speakers of these systems. In each case I placed my smartphone close to the speaker's location outside of the case. You will therefore hear keyboard keys, fans and other background noise. I chose to do it this way in order to give the listener a true impression of how these games will sound to the actual computer user. Note that the PCjr. was recorded without a memory device driver loaded for the proper speed. 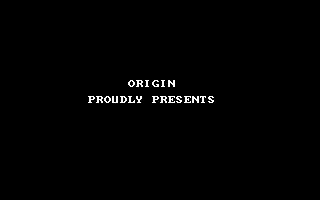 I did not feel anything was to be gained by recording the Origin System's version, DOSBox can do justice to its simple sound effects.